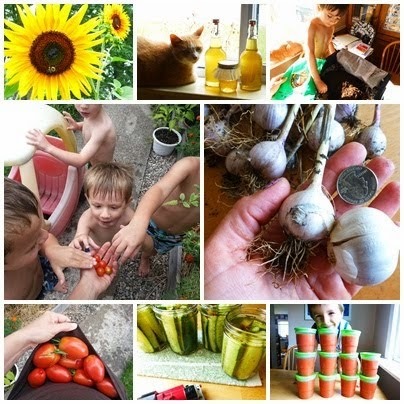 Because I am very new to the beginning-to-end process of growing food, I don't have a specific--or heck, even a general--mental timetable yet. I don't have memorized, from experience, what is supposed to come first, what crops come and go different during seasons, and what is an average date for the summer crops to be absolutely finished. I do know, however, that finding these surprises, just a few days ago in November, is not a common experience. I know this just by reading books. By browsing seed catalogs and looking at a zone chart. By listening to seasoned gardeners and food growers around me. November 3 is not a 'normal' day to find 3 cucumbers (albeit very odd looking ones), enough green beans for a meal, and a dozen bright cherry tomatoes that should be hard and taste terrible, but instead have a sweet, summer ripened flavor. I would not have found these goodies at all if I'd cut all the plants down 2 weeks ago like I had intended. I had figured their time was up, and they were starting to look terrible, anyway, but I never found the time to go out and clear everything out. I couldn't have imagined that any more seeds or fruits would have burst from them like a last hurrah. After my initial surprise and enthusiasm, worry settled deep. Alongside the sweet tomato flavor left on my tongue, there was a sour aftertaste. "This is part of it. This is another small hint that things are changing," a voice said in my head. I realize that global warming is hotly debated, but when my instincts and observations inch toward evidence that something is amiss, even in subtle ways, I'm hard pressed to just ignore it. If we only had longer summers, perhaps that would be a good thing, and everyone, in every growing zone, could easily grow food year-round with the help of simple hoop houses and cold frames. I mean really, if I'm completely honest with myself, the thought of never having to shovel snow from the driveway again makes me sad for only a moment, because I'd pine for drifts to jump in and snowmen to build. Mostly, I don't love winter. The older I get, the more winter makes my bones ache and my heart dread the extra work and energy used to keep warm and from being buried in. However, winter is a part of the midwest cycle I'm used to. Part of the cycle that my surrounding ecosystem has been going through for countless lifetimes. If it were only mild winters and longer growing seasons, then perhaps there would be reason to celebrate. I have to think harder on this for only a few moments to realize that no, it is not that simple at all. Mild winters themselves can have negative effects--pests that would normally die back during the freeze are suddenly a huge problem in spring when their numbers are much larger than usual. If the planet really is warming up, we won't just conveniently gain mild winters and long summers. We may be facing unpredictable weather, just like we did this past spring, when an unexpected killing freeze in April affected apple orchards across the midwest and the east coast. The trees had blossomed with the early warm spring, then the freeze killed many of the tender new blossoms, irreparably harming the crop for the year. Along with strange up-and-down temperatures, we might experience more damaging storms, droughts, floods, with no rhyme or reason. We may have horribly frigid winters mixed in with mild winters. As human beings we've always had to deal with nature's patterns, and have had lots of surprises thrown in, but at a certain point the changes seem too many to be flukes. It seems possible that some very fundamental pieces of our weather patterns are shifting right before our eyes.The idea that weather may begin to seriously lose its predictability, on top of the fact that it can throw some very damaging tantrums at us regularly, has me bothered and concerned. Today I went to finally get some cleanup done in the garden, and after hard frosts the past couple of nights, it's clear that there will be no more last minute bittersweet snacks. Everything from the summer is definitely dead. I am excited to get to work on some fall crops and build my hoop house. But as I cleared away the dead and rotting (and smelly) summer garden plants, I kept thinking of the surprise harvest from just a few days ago, and realized that deep down I am very wary of, and a bit alarmed about, the changes I feel around me. I can only hope that the changes are not so fast and harsh that we'll be helpless to adjust to them.